PDF Converter for PowerPoint | Mac App Storeのアプリ検索・ランキング BuzzMac! 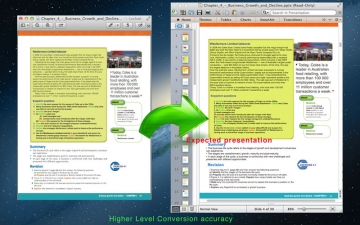 ✭✭✭✭✭PDF Converter for PowerPoint is a PDF converter tool specially designed for Mac OS X users, even for Windows users. and which is a high quality yet affordable PDF Converter,just include the documents and presentations commonly conversion. and can preservers all the text, images , layouts, hyperlinks, table and graphics with high accuracy. ✭ Retains layout and formatting in the output documents. ✭ Extract all the text, layouts , images, hyperlinks, tables, columns, and graphics of the original PDFs to editable PowerPoint presentations. ✭ Customized convert output format ,include Microsoft PowerPoint for Mac 2008/2011 and PowerPoint for Mac 2008/2011. and after conversion, you can also open them use Microsoft Office 2007/2010 on Windows. ✭ Batch conversion mode: Converts up to no limited PDF files to different formats at a time. ✭ Partial conversion mode: Allows users to flexibly convert selected pages or page ranges from large PDF files. ✭ With its simple interface, Mac users can easily convert PDF to other formats with 3 steps. ✭ Support drag-and-drop operation. 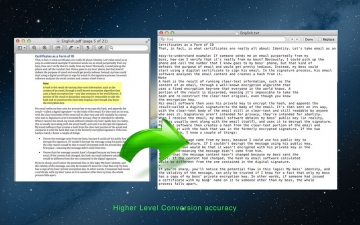 Mac users can effortlessly add, remove, change the conversion order of PDF files. ✭ Support PDFs in multi-language, English, German, French, Italian, Portuguese, Spanish, Russian, Chinese and most of the languages around the globe. ✴ Support Plain text file(.txt) and Jpeg image file(.jpg), Convenient for your edit and usage. ✭ Built-in PDF reader and PDF page thumbnail , You can browse the PDF file. so that you can customized you converted pages. for Plain text file(.txt) conversion, Because different languages in ​​PDF may have different language coding.Output txt file using internationally accepted uniform Unicode encoding, after conversion and open, if you find which is garbled, you only need to set up your text viewer tool can be opened in Unicode, just like TextEdit Application on Mac, or other Text Reader tool.and which will be ok.
✭✭✭✭✭Need help? Please contact us via http://www.variisoft.com/support and you will receive a reply within 24 hours.